We recently began a series of articles to evaluate the history of corn and soybean yields and deviations from trend yield in Brazil and Argentina. The objective of the yield analysis is to provide a basis for forming expectations about the likely yields of the 2017 crops. The first six articles focused on the alternative sources of historical yield estimates, the selection of the appropriate series to use in the analysis for both corn and soybeans, the selection of the best-fitting trend model for each commodity and country, trend yield deviations in each country for corn, and trend yield deviations in Brazil for soybeans (farmdoc daily, November 2, 2016; November 9, 2016; November 16, 2016; December 14, 2016; December 15, 2016; and January 12, 2016). Today’s article examines soybean yield trend estimates and trend deviations for the Argentinian soybean crop. Since Argentina is the world’s third largest producer of soybeans and is the largest exporter of soybean meal and oil, yield and production prospects have important price implications. We begin by providing some perspective on regional soybean production in Argentina. The production map of Argentina from the USDA/FAS gives a visual sense of the concentration. The top three soybean production provinces consist of Buenos Aires, Cordoba, and Santa Fe. Table 1 presents soybean production by country from 1971 through 2016 and gives an indication of overall growth in soybean production in the world, and Argentina in particular. Soybean production in Argentina grew rapidly in the early 2000’s with a significant jump in 2001. 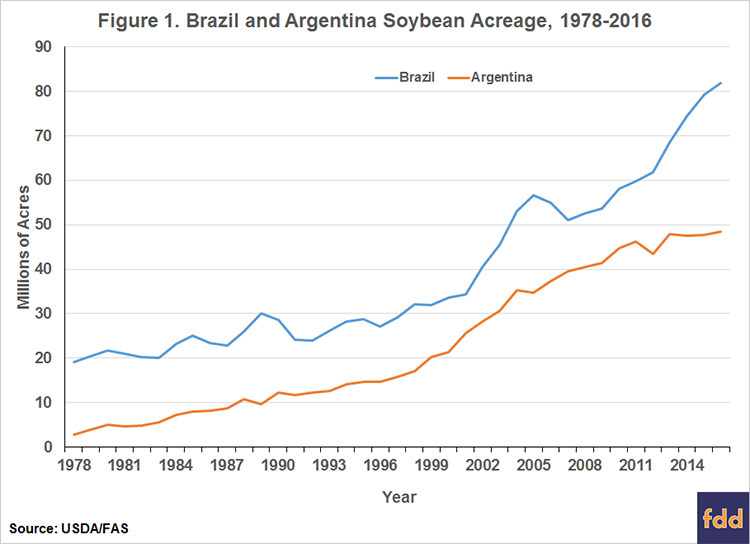 Figure 1 presents the soybean acreage for Brazil and Argentina provided by USDA/FAS estimates from 1978-2016. Both nations exhibited large growth in soybean acreage over the sample period with Argentinian acreage leveling off at the end of the period. Current estimates place Argentina soybean acreage at 48.1 million acres this year. Figure 2 presents the annual soybean yields in Argentina for the period 1978 through 2016. 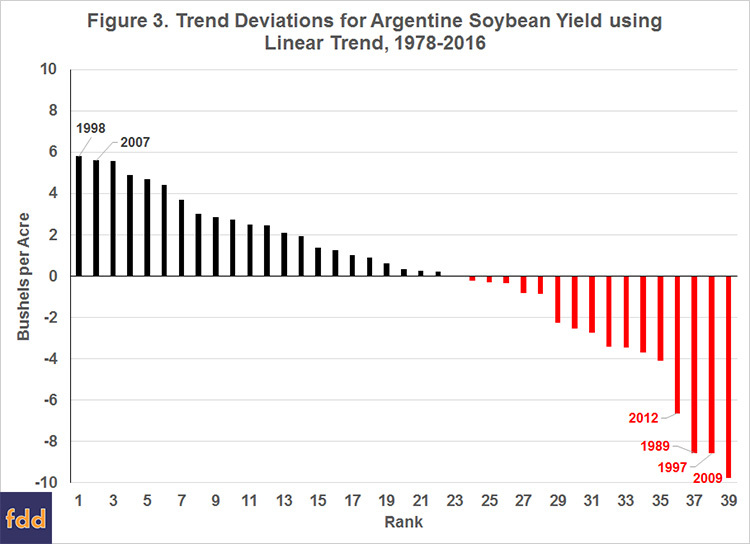 As previously discussed in the farmdoc daily article of November 16, 2016, we chose a linear trend to fit the soybean yield data for Argentina. Note that these yield estimates are provided by the USDA’s Foreign Agricultural Service (FAS) and are based on past trends, expert opinion, industry intelligence, and AgMin, the Argentinian Ministry of Agriculture, estimates. Yields have obviously trended higher over time. The linear trend indicates annual average yield increases 0.37 bushels for Argentina. A linear trend explains about 49 percent of the annual variation in actual yields in Argentina. The historical soybean yields in Argentina show large variation around the trend with an extended period of above trend yields from 1998-2003. The linear trend since 1978 explains a much smaller percentage of yield variation than is the case for the U.S. (81 percent) and Brazil (79 percent). Historical deviations for Argentine soybean yields for the period 1978 – 2016 are shown in Figure 3. Over the 39-year period, the average soybean yield in Argentina was above trend in 22 years and below trend in 17 years. The largest deviation below trend was 9.79 bushels per acre in 2009. 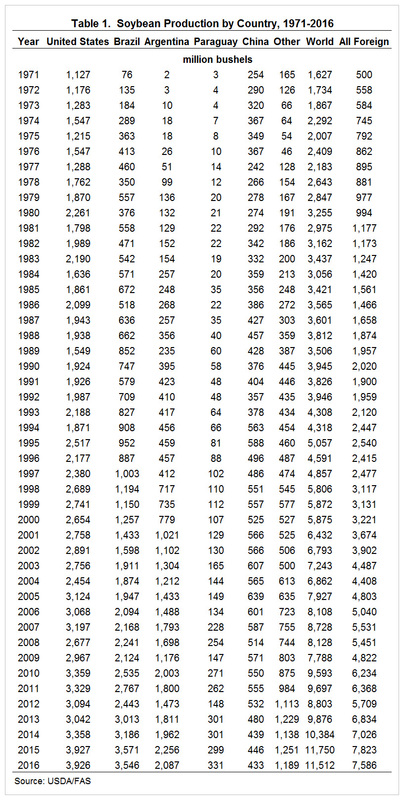 The largest positive deviation from trend was 5.80 bushels per acre in 1998. The average positive deviation was 2.66 bushels while the average negative deviation was -3.44 bushels. The deviation from trend is asymmetric with more years of positive trend deviation and larger magnitudes associated with negative trend deviations. This differs substantially from soybean trend deviations for Brazil. Since 2012, Argentinian soybean yields demonstrate a wide variation around trend with significant yield loss in 2012 and a large positive deviation in 2015. Based on the historical trend deviations, the unconditional probability of a negative deviation is 43.6 percent. If a negative deviation occurs, the unconditional probability of a negative deviation of greater than two bushels is 65 percent, and there is a 29 percent probability of a greater than four-bushel deviation. The probability of a negative yield deviation greater than two (four) bushels, then, is 28 (13) percent. Based on the historical trend deviations, the unconditional probability of a positive deviation of greater than two bushels is 59 percent, and there is a 23 percent probability of a greater than four-bushel deviation. The probability of a positive yield deviation greater than two (four) bushels, then, is 33 (13) percent. 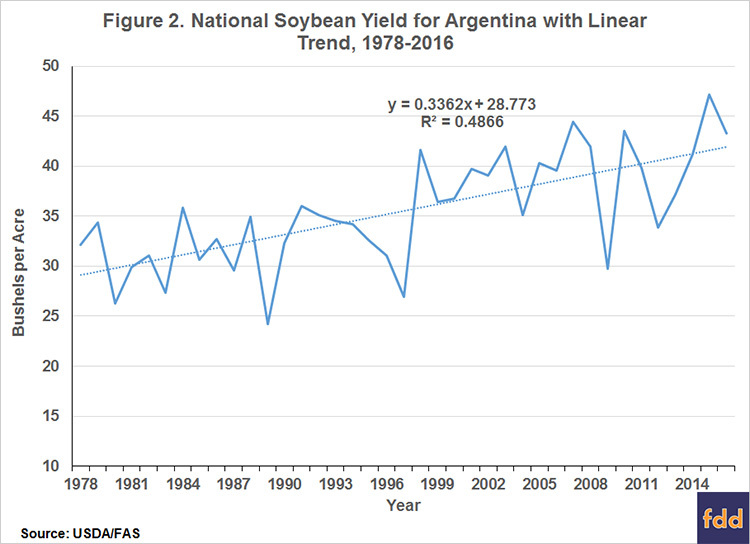 An examination of the national average soybean yields in Argentina for the period 1978 through 2016 reveals an upward yield trend with substantial annual variation. The estimated linear yield trend points to a 2017 average soybean yield of 42.2 bushels per acre, 1.10 bushels below the 2016 average. Based on the projections of harvested acreage in the USDA’s January 12, 2017 World Agricultural Production report, yield at trend value for Argentina points to a 2017 crop of 2.03 billion bushels, 57 million bushels (2.73 percent) smaller than the 2016 crop. Using estimates of the historical yield trend deviations, we estimate there is an unconditional probability of 62 percent of a two bushel trend deviation. A trend yield deviation of two bushels per acre would add or subtract approximately 96 million bushels to our projection of Argentina’s 2017 production. The USDA projects the 2017 Argentinian yield at 43.57 bushels per acre (1.37 bushels above the trend value) and production at 2.094 billion bushels, 7 million bushels larger than the 2016 crop. The USDA estimated production level for Argentine soybeans is 64 million bushels larger than implied by a trend yield. Recent reports in Argentina indicate severe flooding in many growing regions with the potential to reduce production by 100-150 million bushels. If the production reduction materializes in Argentina, 2017 will produce yields well below trend estimates. In the next article, we will examine the impact of La Nina events on Brazilian and Argentinian soybean and corn production. Good, D., T. Hubbs, and S. Irwin. "Assessing South American Soybean Yield Risks: Estimating the Yield Trend." farmdoc daily (6):217, Department of Agricultural and Consumer Economics, University of Illinois at Urbana-Champaign, November 16, 2016. Good, D., T. Hubbs, and S. Irwin. "Assessing South American Corn Yield Risks-Estimating the Yield Trend." farmdoc daily (6):212, Department of Agricultural and Consumer Economics, University of Illinois at Urbana-Champaign, November 9, 2016. Good, D., T. Hubbs, and S. Irwin. "Assessing South American Corn and Soybean Yield Risks: Exploring the Data Sources." farmdoc daily (6):207, Department of Agricultural and Consumer Economics, University of Illinois at Urbana-Champaign, November 2, 2016. Hubbs, T., S. Irwin, and D. Good. "Assessing Brazilian Soybean Yield Risks: Historical Deviations from Trend." farmdoc daily (7):5, Department of Agricultural and Consumer Economics, University of Illinois at Urbana-Champaign, January 12, 2017. Hubbs, T., D. Good, and S. Irwin. "Assessing Argentine Corn Yield Risk: Historical Deviations from Trend." farmdoc daily (6):234, Department of Agricultural and Consumer Economics, University of Illinois at Urbana-Champaign, December 15, 2016. Hubbs, T., D. Good, and S. Irwin. "Assessing Brazilian Corn Yield Risks with the First and Second Crops: Historical Deviations from Trend." farmdoc daily (6):233, Department of Agricultural and Consumer Economics, University of Illinois at Urbana-Champaign, December 14, 2016.